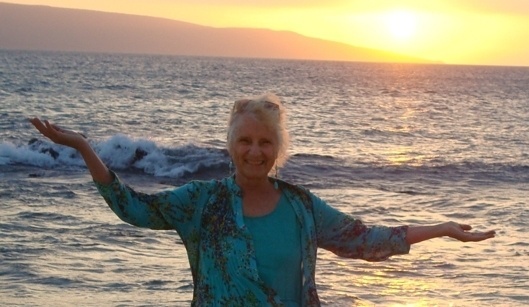 Now living on Maui, after 11 years in southern France. Born in California, she lived in Santa Cruz for 30 years, where she was an exhibiting artist, Open Studios participant, and curator of exhibitions. Her styles and mediums have evolved over the years. Current series are: Dream Journeys, Maui Scenes, and Tropical Abstracts in Oil. While in France, she exhibited her previous series, “Veiled Emotions” in Paris, and her Mediterranean town of Collioure, in 2009, a 30 year anniversary of her first solo exhibit in Santa Cruz. In 2014 she exhibited “Dream Journeys” and “Collioure Collages” at Gallerie du Soleil, Collioure. Previously, in California, her paintings, mixed media work and wearable art have been exhibited at the Triton Museum of Art, San Jose; Pajaro Valley Arts Council Gallery, Watsonville; The Cultural Council of Santa Cruz County’s Open Studio Tour and Government Building Exhibits; the Santa Cruz Art League, Cooper House Gallery, Chaminade Gallery; and, numerous other solo and group exhibits at galleries, artist organized expositions, and contemporary craft expositions. During her Santa Cruz years, she worked as a curator of art exhibits for the Cultural Council of SCC, the Pajaro Valley Arts Council, the Santa Cruz Arts League; and independently curated art exhibits as well. She also organized events, such as Children’s Art Fairs, cultural diversity awards, and performance art /art fashion shows. She has a BA in Art from San Jose State University. Beauty is all around us, and within us. Nature inspires and heals me. I try to capture significant moments, the colors of emotions and feelings, the joy of sacred spaces, the awe of being. It’s about remembering who we are, where we came from, and what we are here to do. For me, it’s about bringing in more golden light!!! Traveling in my dreams, I have had extraordinary experiences – to new and known places, other worlds; meeting new people, guides, teachers, and old friends; flying through the cosmos, or visiting a paleolithic cave. My dreams guide, teach, heal and inspire me. I love figuring out the “codes” of what my soul is trying to tell me. I’ve tried to translate them into images and poems, so you can see where i have journeyed – and maybe go for some dream journeys yourself! These paintings are created from words that are hidden from view. They tell of my adventures and my transformation on the “Path of the Spiritual Warrioress”, my soul’s journey of letting go, leaping into the unknown, and reconnecting. Written in French, these colorful woven stories tell of love, peace, compassion, changes, confusion, clarity, light, inspiration, healing, and the joys and challenges of life. They are a reminder to enjoy the present moment and always remain curious!